In the past month, the healer Mercy in Overwatch has experienced an unprecedented boom in popularity across all competitive levels, especially in the highest tiers. The big spike in Mercy usage coincides with a massive overhaul of her abilities, courtesy of a patch implemented on September 19. These huge changes have sparked debate in the Overwatch community about how pro players influence the game, and whether Blizzard’s pivot into the esports business has changed the game. Before Mercy’s update, the Overwatch community used to lambaste the character for being a “one trick pony” who was supposedly easy to master. Mercy rarely appeared on pro teams. Now, though, that seems likely to change, given that many Overwatch pros love the redesign and believe it was a long time coming. “There was a time that I felt that this game really wanted to embrace players of all stripes... It feels like we’re starting to move away from that. These changes to Mercy do seem to favor high-level players as opposed to newcomers. 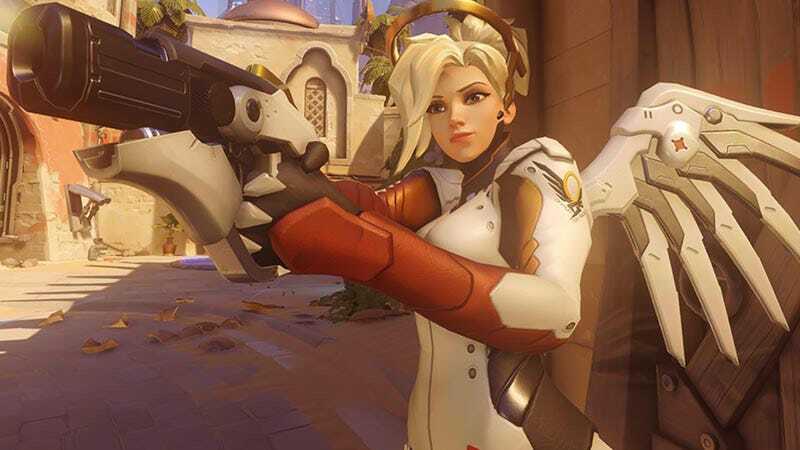 Many Overwatch fans have speculated about whether Blizzard cares more about pros than casual players, and the Mercy update has brought that old debate back in full force. Blizzard told Compete that the Overwatch team has their “heads down leading into BlizzCon” and would be unavailable to comment on the extent to which pro players have influenced Mercy’s rework. However, both Sleepy and Rawkus confirmed to Compete that they’ve had many opportunities to offer suggestions to Overwatch developers. Sleepy and Rawkus still believe further refinements should be made to Mercy’s build, though, particularly the length of her Ultimate ability. Rawkus said he hoped Blizzard would “nerf Valkyrie to 12 seconds.” Sleepy had the same suggestion: “make it 10 or 15 seconds instead instead of 20.” Neither player had big complaints about the new implementation of her resurrection ability, but it’s also worth noting that neither player has yet had to play with new Mercy on the tournament stage. Most pros haven’t had to compete with new Mercy yet. Blizzard has allowed most tournaments, but not all, to use a server that features an older build of the game, prior to Mercy’s patch. This isn’t the first time that Blizzard has inconsistently implemented a patch in pro Overwatch. Last March, Blizzard delayed the release of a patch for participants in the Overwatch APEX series. Meanwhile, the players in the Overwatch Carbon Series, which Blizzard co-hosted, had to play the newest build of the game. The APEX players got two weeks to practice before the patch went live in competition. Pros have had far longer than two weeks to try out the Mercy patch, considering it’s been over a month and counting. Participants in APEX, the Overwatch World Cup, and Overwatch Contenders have not had access to Mercy’s makeover. It seems unlikely that Blizzard would implement the changes before the Overwatch World Cup finals on November 3-4. Meanwhile, competitors in APAC Premier 2017 have already been playing the game with new Mercy. So far, the APAC teams seem to love Mercy. She’s been the go-to healer pick for all teams in almost every match. The preponderance of Mercy has made these matches feel repetitive to watch, but her update hasn’t gone live across the entire pro scene, so it remains to be seen how Mercy’s updates will impact the Overwatch spectator experience. Mercy’s makeover doesn’t seem fully baked yet, anyway. Based on Rawkus and Sleepy’s feedback about the length of Mercy’s current Ultimate ability, it seems likely that Blizzard will issue another update or two to Mercy before she makes her debut. Or, at least, the pros seemed to think so. “I do think there will be some more changes to Mercy before Overwatch League begins,” Sleepy told Compete. Rawkus agreed that, without further changes, Mercy will continue her reign over competitive play: “easily, Mercy will be near a 100% pick rate.” But for pro players? Rawkus didn’t seem so certain. “It’s hard to tell,” he said. It’s also hard to tell whether or not the Overwatch community will continue to hate Mercy. Before her update, Mercy had a reputation as a “low skill” character for newbies. In her current form, Mercy is considered unbalanced and overused. Nico Deyo believes that the hatred of Mercy is about her resurrection skill, but also, about the original design choices and branding of Overwatch. Rawkus and Sleepy argued the reason they didn’t like Mercy before was not due to her resurrection ability, but just because she wasn’t powerful enough. No matter the motivation, there’s no going back from these Mercy changes. For pro players, that’s good news. For everyone else? Overwatch just got a little more exclusionary.